Our mission to create a game in a week is complete! We were attempting to develop and release a new mobile game in just seven days. You can read all about what we’ve been doing, and why on this blog post, or view all the development diaries here. We did it! Our experiment, to create a game in a week, was a success. 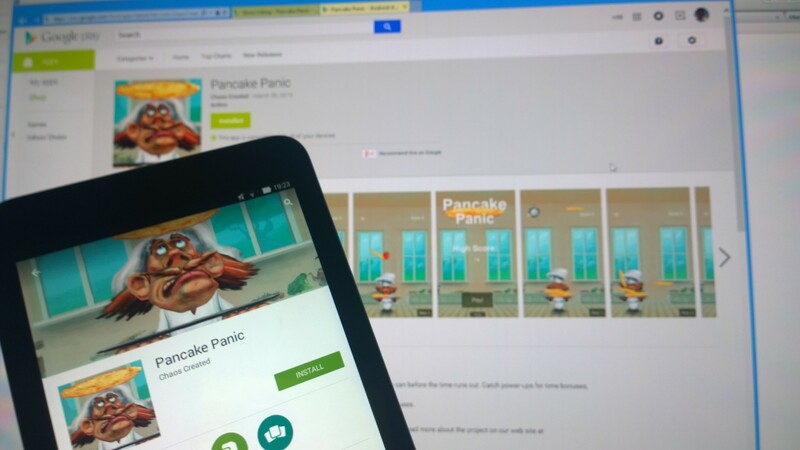 Pancake Panic is now live on the Google Play Store and ready for you to download. There are some things I’d like to add to the game, and will do so over time. The intention was to allow in-app purchases of additional bonuses, but I’m leaving this until we have social sharing included too, and my feeling is that the above system to earn power-ups might be more effective. I also wanted to include more animations outside the window, but we ran out of time. But we’ll add these in future updates. I’d also like to take another look at the UI and add some polish there too. The Windows Phone version is almost ready too. It’s all up and running, but optimisation needs a little more work, as the performance isn’t quite as good as it should be. Hopefully we can submit that version tomorrow. The iPhone version will follow in a couple of weeks. A lot of the development on this game was done with children from Hamo Primary School during two coding workshops. Their feedback and ideas helped shape the app, and developing the app was a great way for us to help teach year five and year six pupils how to code. In the meantime, if you have an Android phone or tablet, grab Pancake Panic – for free! – now from the Google Play Store. And let us know your thoughts, and suggestions, either here or on our Facebook page.